The working class has had its historical protagonism wrested away from it, to the advantage of the brand-new democratic and nationalistic myths of a bourgeoisie that holds economic and political power. LET US PLACE IT ON RECORD THAT HISTORICAL MEMORY IS A CLASS WAR BATTLEGROUND. As the research presently stands, the book by Pous and Sabaté about Antonio Martín and the Civil War in the Cerdanya, as well as the tiresome repetition of their theses and contentions by virtually every other historian who had dealt with the subject, stands out as the most striking and extreme sample shedding light on the Official History mentioned in this Manifesto. OFFICIAL HISTORY IS THE CLASS HISTORY OF THE BOURGEOISIE. THEY PRAISE and EULOGIZE the methods and repressive efficacy of the Assault Guards and Civil Guard (renamed the Republican National Guard) or political police (the Military Intelligence Service, or SIM). Perhaps they not very aware that in so doing they are singing the praises of torture. But that is a feature that, like no other, flags up the influence of class outlook and interests in the field of history, because such praise for the efficacy of torture and republican police and judicial crackdowns on revolutionaries, runs parallel to the displays of horror at the class violence unleashed against bourgeois in July 1936 by “uncontrollable”. Experts on the subject of violence and efficient in keeping the books on violent deaths they may well be, but they display total partisanship when they as anarchist “terror” or police “efficiency” what was at every step the violence of one class against another. Except that, as far as they are concerned, workers’ violence amounts to terror, whereas, violence coming from the state, the SIM, the Unified Socialist Party of Catalonia (PSUC), the Republican Left of Catalonia (ERC) and Estat Catala is to classed as “efficiency”. On no grounds other than their class outlook. Violence is judged by double standards, depending on one’s view of the person inflicting or enduring it. Official History approaches the Civil War as a fascism-antifascism dichotomy, which facilitates consensus between left- and right-wing academic historians, Catalan nationalists and the neo-stalinists who, across the board, are all agreed in chalking the republic’s failure up to the radicalism of the anarchists, POUMists and revolutionary masses who are thereby made into their shared scapegoats. By ignoring, omitting or down-playing the proletarian and revolutionary aspects of the period of the Republic and the Civil War, Official History manages to turn the world upside down, so that its leading pontiffs have awarded themselves the task of rewriting the whole thing ALL OVER AGAIN, thereby completing their hijacking of historical memory, in yet another step in the overall process of expropriating the working class. When all is said and done, it is the academic historians who write History. Even as the generation that lived through the war is dying out, the books and handbooks of Official History are ignoring the existence of a magnificent revolutionary anarchist movement and, ten years from now, might dare claim that NO SUCH MOVEMENT EXISTED. The mandarins firmly believe that NOTHING THEY do not write about ever existed: if the history calls the present into question, they deny it. Faced with the growing bringing of the profession on historian into disrepute, and in spite of whatever honorable and outstanding examples there may be around, we, Antonio Gascón and Agustín Guillamón, abjure the description ‘historian’ in the aim of averting undesirable and unpleasant confusion: grounds enough for us lay claim to the honest pursuit of collectors of ancient testimonies and papers: rag-pickers of history. There is a stark contradiction between the trade of retrieving history memory and the profession of lackeys of Official History as the latter needs to forget and eradicate the past existence and, consequently, the feasibility in the future, of a redoubtable revolutionary mass workers’ movement. This contrast between trade and profession is resolved by means of ignoring what they know or ought to know; and this makes them redundant. Official History purports to be objective, impartial and all-encompassing. But it is characterized by its inability to acknowledge the class element in its alleged objectivity. It is, of necessity, partisan and cannot embrace any outlook other than the bourgeoisie’s class outlook. And it is, of necessity, exclusivist and banishes the working class from the past, future and present. Official Sociology would have us believe that the working class, the proletariat and the class struggle are no more; and it is up to Official History to persuade us that they never existed. An Executive Committee made up of stalinists and nationalists was set up to coordinate and oversee the crack-down on libertarians in the Cerdanya. That crack-down and the campaign of defamation were closely connected. The massacre on 9 September 1936 and all murders committed in the comarca, plus all thievery and criminality were laid at the door of a wrongly blamed scapegoat: the anarchists. This was a distraction from the criminal culpability of the PSUC-ERC and it criminalized the class enemy: the anarchists. That the majority of historians lie, manipulate or falsify, some of them unknowingly, but most unconsciously: this is within the very nature and condition of the trade by which they make their living. The bourgeoisie’s Hallowed History is a forgery, concocted to spare the nationalists and stalinists from all blame for the outrages during the early days of the Revolution. One good example would be the prevailing historical writing about Puigcerdá and the Cerdanya, which, for upwards of 80 years now, has successfully concealed the fact that the protagonists of the 1934 coup suffered harsh reprisals at the hands of the pro-Spain rightists (españolistas) in 1935; that that repression provoked the Catalanist coup-makers on 1934 into taking revenge by participating in the abuses and arbitrary acts which followed the July 1936 defeat of the military in Barcelona and across Catalonia. And, in particular, that more than one of them belonged to Estat Catalá, or were, for the most part, known members of the ERC listed in the Causa General as answerable for the local killings. In 1937 the republican and stalinist authorities were deliberately lying and knowingly concocted that dark legend denigrating Catalan anarchism. It was a p[owerful political weapon used against the CNT-FAI, as well as the perfect defence against their own crimes; these could be pinned on the anarchists. The bourgeoisie’s historians lie and painstakingly choose from among the documentation held in the archives and thereby become the heirs and successors to the propaganda campaign of denigration and defamation which, for the first time in history, successfully ensured that the genuine social and historical facts were eclipsed and replaced by a different fictional reality conjured up by this campaign of propaganda and infamy. In 1937-1938, Catalan stalinists and nationalists subscribed in the same innate, civilized and ethical way to a radical political racism vis à vis the anarchists, in a muddle of ethnic, cultural, ideological and linguistic prejudices. Anarchists were scorned and dehumanized, so that, in the nationalist and Stalinist imagination, they stopped being people and instead became brutes and beasts who could be and deserved to be sacrificed on the altar of the homeland. Just the way the españolista right-wingers had been a few months earlier. All of these monsters, serial killers, vampires and priest-eaters who had popped up all over Catalonia like some virus and whom the historians have described as criminals are deserving of a second look. All the historians are under suspicion of partisanship and sectarianism. 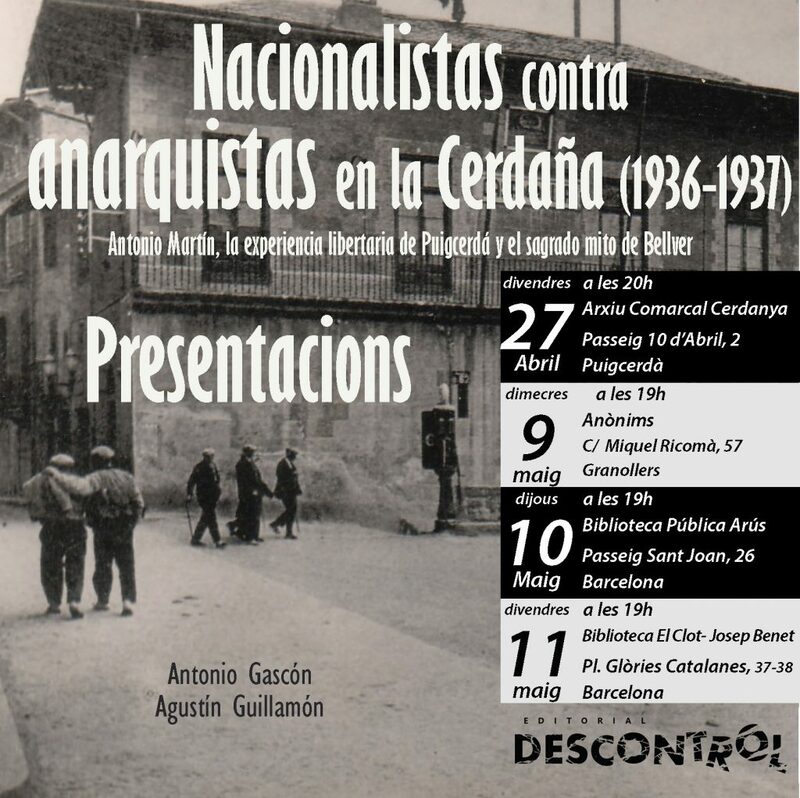 Over the summer of 1937, the CNT – as an organization – effectively ceased to exist in the Cerdanya. 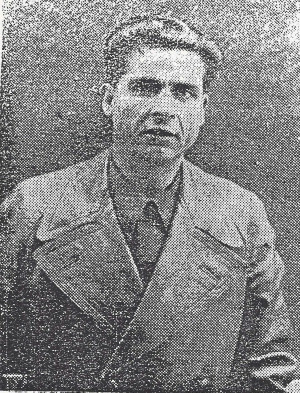 The brutal anti-libertarian repression was orchestrated by an Executive Committee on which Vicente Climent (PSUC), Juan Bayran Clasli (PSUC), Juan Solé (mayor of Bellver), a Watch officer by the name of Samper and another, unnamed officer, both of them Estat Catalá members, served. That the mission of bourgeois History is to weave myths about nationalisms, democratic totalitarianism and capitalist economics in order to persuade us that these are eternal, immutable and immoveable. A perpetual, complacent and a-critical present renders the past banal and demolishes historical awareness. We are shifting from Hallowed History towards post-history. Post-truth is a newspeak for a (these days frequent) situation wherein the reporter creates public opinion by bending facts and reality to suit emotions, prejudices, ideologies, propaganda, material interests and politics. If something seems true and in addition flatters one’s vanity or is satisfying emotionally, as well as bolstering prejudices or identity, it deserves to be true. A decent advertising campaign turns lies, fraud and the counterfeit into a palatable, convenient post-truth. Post-history is no longer the narration or interpretation of events that happened in the past, and is turning into a narrative that hacks of every hue and ideology concoct for the publishing market, regardless of facts and historical reality, which are now regarded as being merely symbolic, secondary, dispensable, prejudicial or hidden.